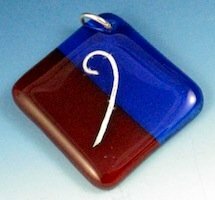 Make a fused glass silver pendant with pure silver wire inclusion, producing a striking contrast in colors and texture. In this project flattened pure silver wire is used as an inclusion, sterling wire is not suitable for normal fusing work due to its reaction to high fusing temperatures. Thin material is normally used to prevent the glass from breaking. Silver sheet may also be used to make inclusions. Shapes can be cut with scissors, scrapbook shape cutters produce produce good results on thin material. There are a wide range of scrapbook cutters available. This jewelry item is made from two pieces of transparent fusing glass with a clear cap. Contrasting transparent colors produce more striking results than a single color. One of the issues that can arise when firing inclusions is the formation of unwanted air bubbles that become trapped around the inclusion. To reduce the problem the base is made from two separate pieces and the pendant is fused on fiber paper. This technique allows air to escape through the cut pieces during the fusing process. By placing a piece of medium clear frit under the corners of the cap air will also escape. Hold frit in place with fusers glue. The size of the project and wire shape can also cause bubbles to appear. 1. Cut two piece of contrasting colors 3/4" wide and 11/2" long. 2. Cut clear cap slightly larger than the base. 3. Bend 20 gauge (or thinner) pure silver wire into shape and gently flatten with a hammer. 4. Place fiber paper on shelf, put base pieces on paper, make sure cut pieces are closed up and square. 5. Place metal shapen across the cut in the base . Center cap on top of inclusion, put shelf in the kiln. 6. Bring temperature up slowly to about 1000° F (538° C) and hold for 10-15 minutes. 7. Check item, if edges are nicely rounded drop temperature quickly to 950° F (510° C) and anneal object for 30 minutes. 8. Allow to cool to room temperature and then remove from fusing kiln. The rear of the pendant will probably have a rough texture from the fiber paper. This can be smoothed out by re-firing on thinfire paper or a prepared kiln shelf, fire polishing the glass. If the fusing temperature has been too high, small spikes may form around the edges. These can be removed with a diamond hand pad or table top grinder and the item gently fire-polished. The photo below is of two different styles of silver inclusions, experiment with various shapes and lengths.